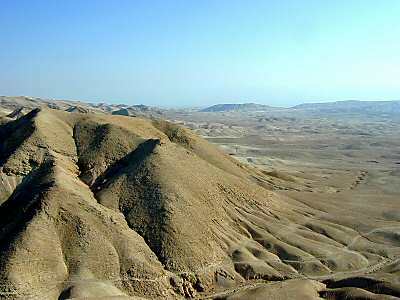 While David was at Horesh in the Desert of Ziph, he learned that Saul had come out to take his life. And Saul's son Jonathan went to David at Horesh and helped him find strength in God. "Don't be afraid," he said. "My father Saul will not lay a hand on you. You will be king over Israel, and I will be second to you. Even my father Saul knows this." The two of them made a covenant before the Lord. Then Jonathan went home, but David remained at Horesh. The Ziphites went up to Saul at Gibeah and said, "Is not David hiding among us in the strongholds at Horesh, on the hill of Hakilah, south of Jeshimon? Now, O king, come down whenever it pleases you to do so, and we will be responsible for handing him over to the king." Saul replied, "The Lord bless you for your concern for me. Go and make further preparation. Find out where David usually goes and who has seen him there. They tell me he is very crafty. Find out about all the hiding places he uses and come back to me with definite information. Then I will go with you; if he is in the area, I will track him down among all the clans of Judah." So they set out and went to Ziph ahead of Saul. Now David and his men were in the Desert of Maon, in the Arabah south of Jeshimon. Saul and his men began the search, and when David was told about it, he went down to the rock and stayed in the Desert of Maon. When Saul heard this, he went into the Desert of Maon in pursuit of David. Saul was going along one side of the mountain, and David and his men were on the other side, hurrying to get away from Saul. As Saul and his forces were closing in on David and his men to capture them, a messenger came to Saul, saying, "Come quickly! The Philistines are raiding the land." Then Saul broke off his pursuit of David and went to meet the Philistines. That is why they call this place Sela Hammahlekoth. And David went up from there and lived in the strongholds of En Gedi. This cat and mouse game between David and Saul can't last much longer. Various people in the land are clearly willing to sell David out to Saul, even though David is popular with the people in general. David has only 600 men with him, a difficult number, because it is too small to meet a great army but still a lot of mouths to feed in the desert.